Print out the cards onto card stock, write the Bible verse on the cards and make copies. Children learn that when they follow the Good Shepherd they will enjoy a life of goodness and mercy. 1. Print out the picture and have your children color it. You can also glue the coloring sheet to a piece of construction paper to make a frame. Have your children glue fun foam hearts to the frame. Children make doily sheep and glue them to a Bible verse sheet. They can write the names of the sheep next to each doily sheet. 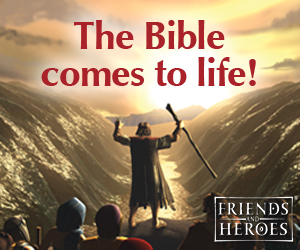 Use this activity to help your children remember the Bible verse. Preparation: You will need two other puppets for this lesson preferably sheep. If you don't have puppets, you can just use stuffed animals. Teacher: I have invited our special friend back today. Woolie where are you? Teacher: Woolie it is good to see you this morning. Did you bring some friends with you today? Teacher: Oh, I know these little sheep. Children, I would like you to meet Woolie's friends, Goodness (pointing to Goodness) and Mercy (pointing to Mercy). Goodness is a very good friend. She always tells the truths, and is loving and kind. And Mercy, she is also a very good friend. Mercy is the kind of friend everyone would love to have. She will be your friend no matter what. Even if you do something that isn't very friendly, she will always forgive you, even if you don't deserve it. No matter how bad you treat her, she is always ready to forgive and forget. Woolie, you are very lucky to have such good friends. Teacher: Woolie, what are you doing? Goodness and Mercy seem to be following you every where you are going. Teacher: Woolie are you trying to tell us something about the Good Shepherd? Teacher: Well, let's look at our Bible verse today. Maybe we can figure out what Woolie is trying to tell us. Who remembers what book of the Bible and chapter we are studying? Have a child come up and find the 23rd Psalm or try to open the Bible to the middle. This verse is telling us that if we make God our Shepherd and follow him, goodness and mercy will follow us. God will guide and protect us and show us how to live a good life. He will show us mercy, or loving kindness, and forgiveness when we mess up. He will give us another chance. He will always love us no matter what. Woolie, thank you for coming and telling us about the Good Shepherd. We are very glad you came. Bye, bye Woolie. We hope you can come back and visit us again soon. Father, we praise you and thank you for caring for us. Help us to always remember to follow you. And thank for your loving kindness and forgiveness when we take a wrong turn. We know that you will always be there for us when we return. Amen. 1. Before class print out at least two sets of the footprint shapes. 2. In class divide the children up into teams and give each team a set of footprints: one goodness footprint, one mercy footprint, and one blank footprint. 3. On the word go, the children at the beginning of the lines should place two of their footprints out in front of them in a row facing towards the other end of the room. Have them place one foot on each footprint, and then place the third footprint in front of the first two and move their back foot onto the footprint in front. They then pick up the footprint behind them and place it in front moving their back foot onto the newly placed footprint. They should keep walking like this until they get to the end of the room. When they get to the end of the room, they should pick up all three footprints, race back to the other end of the room and give the footprints to the next child in line. The team that has all their players reach the other end of the room first wins. If you have very little children, just give each child a set of footprints. Have them all line up in a row and demonstrate how to walk across the room with "Goodness" and "Mercy" following them. 1. Set up ten sheep (Use stuffed animals or pictures.) in the front of your room. 2. Place a name tag around the neck of each sheep using the Bible verse to name them. Name one "Surely", one "Goodness", one "And", one "Mercy", one "Shall", one "Follow" and one "Me". Make up some other names for the rest of the sheep. Turn the name tags around so the children can not see the names. Write the verse on the board so all the children can see it. (It really doesn't matter if the children can read or not.) Read the verse to the children and have them repeat it to you several times. Ask a child to come up and pick a sheep that he thinks might be named "Surely". Turn over the name tag of the sheep he has picked and read the name. If it is the right sheep, place it to the side. If it isn't the correct sheep, they next child should pick a sheep. Next have the children look for the sheep named "Goodness" and keep going until all the sheep have been placed in order to spell out the verse. (Note: If you have very young children, you can just look for "Goodness" and "Mercy". 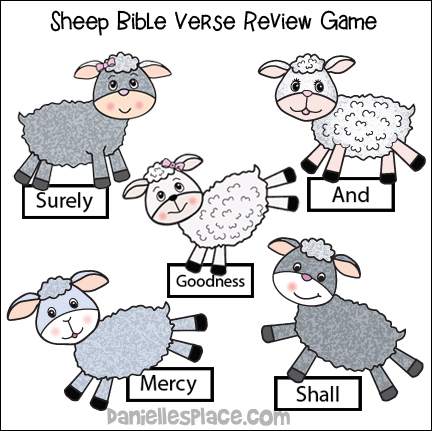 Just place a bunch of sheep in the front of the room (or pictures of sheep) and have the children take turns picking a sheep to see if it is "Goodness" or "Mercy". Before class print out the cube, cut it out, and tape it together. In class have your children sit in a circle and take turns throwing the cube into the center of the circle. 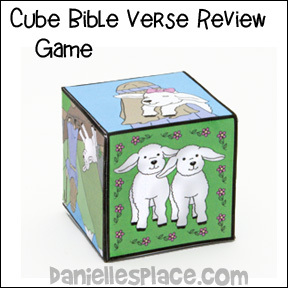 The children should say the verse corresponding to the picture on the cube. Give them a small treat like Teddy Grahams each time they say the verse. If they don't know the verse, tell them the verse and have them repeat it, and then give them a snack. Here's a snack idea - A cute sheep can be made with a donut hole body, pretzel stick legs, and mini-marshmallow head attached with a broken pretzel stick. Sent in by Dian, Missoula, MT. 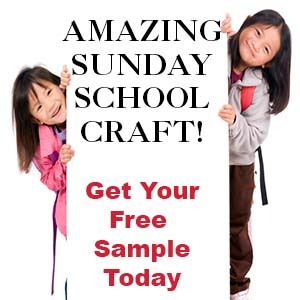 Copyright Notice - While many of the crafts on this site are free, they are still copyrighted. They are for personal use only. They may not be reproduced or transmitted in any form or by any means, electronic or mechanical, except for local church, school, or home use only. The copyright notice must be included on all copies. To request permission to copy this material for any other use contact me by e-mail.